Image Size: 16 X 23 in. 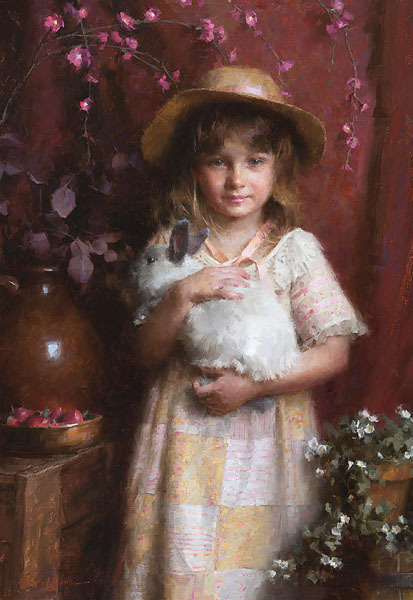 Unlike Lewis Carroll’s famous literary character, Morgan Weistling’s Alice has managed to catch her white rabbit without having to dive down his hole after him. A featured work at the 2011 Jackson Hole Art Auction, Alice sold for over $86,000, far exceeding the auction’s estimated sale price. Alice showcases the blend of vibrant approach and outstanding execution that has made Morgan one of the country’s most important contemporary painters. Alice exceeded the auction’s estimate because it so perfectly represents the bridge between the contemporary look and classic painting style that Weistling is renowned for. Our Greenwich Workshop Fine Art Edition delivers all the subtle nuances and color harmonies Morgan wove into his original work. Now you, along with the unsuccessful bidders at the Jackson Hole Auction, have the opportunity to own Alice.